BYS sends news that John Todd has closed on his listing for sale, the 28.7m raised pilothouse motor yacht Adventurer, with Tucker Fallon at Bradford Marine Yacht Sales representing the buyer. 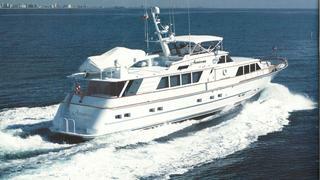 Built by US yard Burger Boat, she was built for experienced Burger owners and delivered in 1985. The design team of Jack Hargrave, Jack Bursack, and the Burger Boat Company produced a comfortable yacht for family cruising, both inside and out. In 1998, one of the naval architects from the Hargrave office was retained to re-design the aft deck with a more modern European-style stern. In the process, the aft deck was enlarged and a fourth stateroom added. Easier access to the swim platform was facilitated by building in an integral stairway from the aft deck. The overall profile as a result is both modern and classic. Adventurer sleeps eight guests in four staterooms comprising a master suite, a VIP stateroom, a double and a twin and all staterooms have en suite facilities. Most of the instruments and navigational aids are duplicated on the large flybridge and there are three swivelling helm seats just aft of the helm with teak foot rests for each. A venturi type windscreen deflects wind forward and to each side while a full beam Bimini top spans the flybridge seating area. L-shaped bench seating is built in aft to port and starboard with large areas of dry stowage beneath. Outdoor stereo speakers are mounted into the base of the benches and there is a wet bar, fridge and ice maker for al fresco entertaining. Adventurer was asking $1.28 million.